Buy 1 for $19.51Buy 2 / Save $1.04!Buy 3 / Save $3.90! Size (inches): 14.76" X 4.09" X 7.09"
This storybook favorite wears a highly detailed dress and admires a blue bird perched on her finger. Snow White includes a wood stand and certificate. This doll is part of a limited edition of only 1000 dolls. 12" in height. 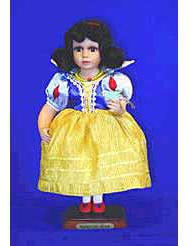 Snow White stands on a wooden base with a nameplate. More Photographs - Snow White - 12"
End of More Photographs - Snow White - 12"